Tristemente, la Yeguada de Ymas confirma el cese de la esponsorización de Juan Matute Guimón. The Yeguada de Ymas sadly confirms the end of the sponsorship of Juan Matute Guimón. 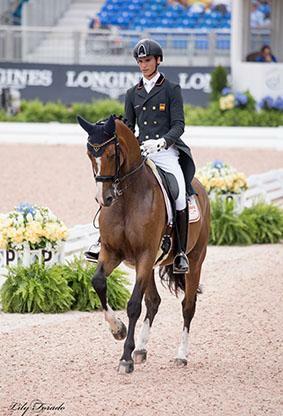 Articulo de Natalia Bacariza en Dressage Headlines por Besty LaBelle. ENHORABUENA POR VUESTROS RESULTADOS EN "RUTA DE VERANO COPA ANCCE ASTURIAS"
First issue: the Yeguada de Ymas is not based in Madrid. It is based in Toledo, near Oropesa Toledo, and also it has installations in Wellington, Florida. Second issue: the Yeguada de Ymas stopped breeding PRE four years ago, and instead started at that time to breed CDE. We have invested in German and Dutch studs and have covered mares with Vitalis, Sir Donnerhall, Fürst Romancier, Juan de Hus, Bretton Woods, Londerderry, and Sezuan among others. The paring of studs and mares was deeply studied, organized and decided by me. The products born have been ridden by various riders based in our Spanish installations. We have always had riders based in our Spanish installations and they have had the tremendous responsibility of placing these young horses under the saddle. They have also frequently competed them. The third issue: horses were scouted both by Juan Matute Azpitarte and also me. Opinions were always interchanged and shared. I am sure on one or more occasions we have been spotted together with my husband and Victor Navarro (also once involved in our project) in the different auctions such as Hannover among others. It was a team effort and a lot of fun!!! Undoubtedly Juan's input was and is always extraordinary as important. Fourth issue: and this must have made Juan Matute Azpitarte laugh: Juan Sr has never ever been the property manager of any of our installations. That would imply dealing with the design of the installations, construction, landscaping, dealing with gardeners, the plumbing, irrigation, the regulations of the community, just to mention a few of the responsibilities implied in that notion. This is not what Juan did nor does. Juan was and continues to be a trainer for the Yeguada de Ymas and, as said in my Facebook publication, has had since 1982 a personal relationship with my family. Issue number five: we at the Yeguada de Ymas have always had multiple riders riding our horses. In Wellington there were 6 at one point (now there are only two). At our Spanish installations we have had for many years a total of 3, then reduced to two, and finally due to the lack of need now there is only one. There is no expanding nor are we doing anything different from what we have done in the past years. We have sold, leased and donated horses since the very beginning of our breeding adventure. We are a very discrete enterprise. Very rarely do we comment or get involved in what we believe is just “noise”, nor do we feel the need of the limelight nor do publish things we are involved in for the sake of applause. Those that know us know we are pretty down to earth people, extremely low key, and happy to stand in the background. We have always respected the decisions of our Federation, trainer and our riders. What we have done is provide our riders with what we thought could help them achieve the success they were aiming for. However, at the same time, what is also understandable is that having an incredible installation at Toledo, and a magnificent installation at Wellington Florida, we were not willing to open a third base in Madrid. Juan Matute Guimón chose to stay in Madrid. He wants to do new things and most importantly wants to study in a university in Madrid. One needs to do what one believes he/she needs to do, and we applaud the bravery and decision taken. Also involved were changes in training fees and calendar. All of this was talked about, decisions were made accordingly, and accepted with complete harmony and mutual understanding. Sorry to disappoint but there has been no blood, no stabbing or lack of civility. As said in other publications of ours, we stand by Juan’s decision as he understands ours. He is and always will be a magnificent rider and I applaud his initiative to do exactly what he feels he needs to do. We are sure he will achieve great success in whatever he sets his mind to do.